FILE - A nurse looks as he weighs a malnourished girl at a malnutrition treatment center in Sanaa, Yemen, Oct. 7, 2018. FILE - A 17-year-old boy holds his weapon in High dam in Marib, Yemen, July 30, 2018. 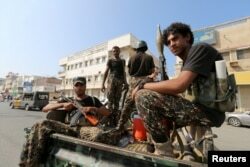 FILE - Houthi militants patrol a street where pro-Houthi protesters demonstrated against the Saudi-led coalition in Hodeida, Yemen. "When — and I hope it is when and not if — these redeploys happen, they will be the first ones in this long conflict," he said. Griffiths acknowledged that the "the war in Yemen … shows no sign of abating," and said there needs to be real progress on the military redeployments before the focus can shift back to the political track. In February, international donors pledged $2.6 billion for Yemen relief operations. Saudi Arabia and the United Arab Emirates — who are prosecuting the war against the Houthis — pledged an additional $1 billion. FILE - A girl sleeps on a bed at a cholera treatment center in Sanaa, Yemen, Aug. 4, 2018. "Closing or scaling back such programs — at a time when we are struggling to prevent widespread famine and roll back cholera and other killer diseases — would be catastrophic," Lowcock said.